A naming machine that automatically creates names without user input? The Fantasizer invents new words you will never have heard before. Who knows, maybe one of these fantasy words will be so ingenious that you'll want to choose it as a name for your project? It will be a unique name, after all. Use the Fantasizer settings to determine how exceptional and weird the resulting names should sound. You can decide if you'd raher like a universal name which can be used anywhere, or if you're looking for special names with more exotic rules. If you want certain letters to be included in your name suggestions (e.g. your initials), you can also specify them. What's the logic behind the Fantasizer? Due to the complexities of defining allowable sound combinations, the underlying functions of the Fantasizer are just as complicated as its user interface is simple. The phonetic skill of the fantasizing tool algorithms mean that you can be sure that you will never encounter a result like Zfondb, whereas you might very well be presented a term like Zefona. Test the Fantasizer tool now - for free! Give NameRobot's fantasy name generator a try and test it for free. You can perform up to five checks with the tool to see how it works. Find fantasy business names with just one click - no input needed! 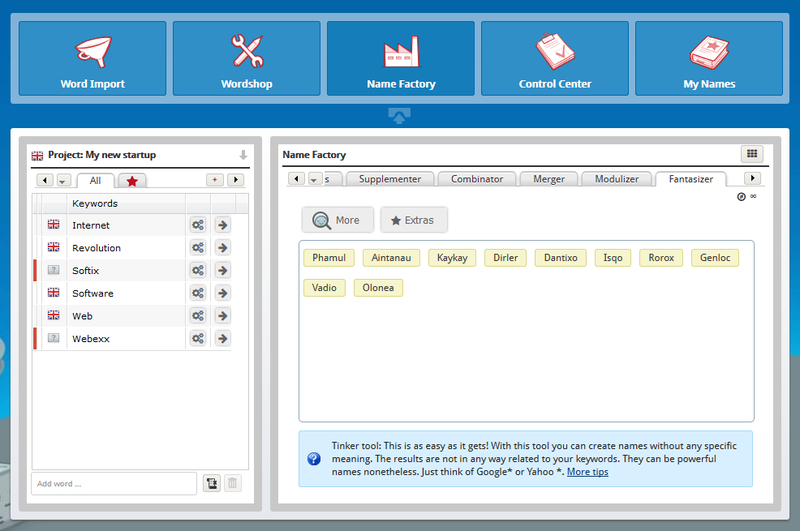 Go to the Fantasizer tool in the Name Factory right now to test it out! If you don't have a NameRobot account yet, simply register and start looking for a name! *The names mentioned above are registered trademarks. They were not developed with NameRobot and merely serve as well-known examples to illustrate certain kinds of names.